As hurricane Beryl, now weakened into a tropical storm, approaches Haiti after soaking the Dominican Republic with gusty downpours, Haitians are still worried because, in Haiti, it is often the rainfall that causes major damage after a hurricane or tropical storm. Weather service in Haiti announced there will be sporadic rainfalls and gusty winds throughout the day in parts of the country. Protection Civile in Haiti issued a warning to citizens living in areas close to the ocean to be vigilant. 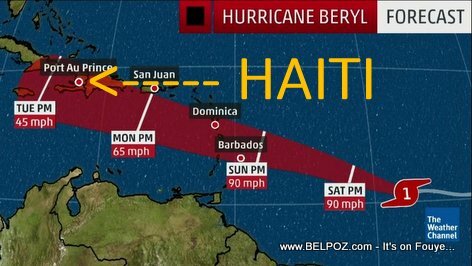 Lucky for us, Tropical Storm Beryl will pass through Haiti very quickly. According to the latest tropical weather outlook from the National Hurricane Center in Miami, what's left of Tropical Storm Beryl is producing gusty winds and areas of heavy rain over portions of central and eastern Hispaniola, and the adjacent Atlantic and Caribbean waters. This system is expected to move west-northwestward across the rest of Hispaniola today and over the southeastern Bahamas this evening.